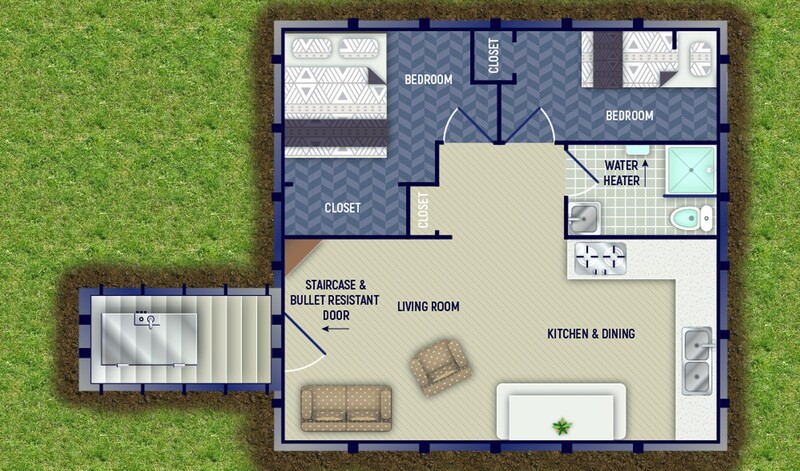 This new 1600 Square Foot Double Wide Design offers a more like home feel. With its open floor plan your Kitchen, Dining and Living Area are conjoined allowing for space utilization. This unit can be customized with our Signature Steel Table and Bench or left open for more traditional home furnishings. Beyond this common area are three bedrooms with walk in closets, a Master Bedroom, Master Bathroom, a Food Storage Room as well as a spacious pantry. The Admiral Series Units come equipped with our Blast Resistant Door, Escape Hatch, NBC Air Filtration With Blast Valves and Overpressure, Full Kitchen with a Double Counter Including a Double Sink, Composting Toilet, Shelving For Food Storage, Water Pressure Pump, Shower, Hot Water Heater, Grey-Water Evacuation Tank, Grey-Water Evacuation Pump, Bathroom Door, 12 Volt LED Lighting, Solar Generator Charging System With Battery Supply, 12 Volt TV/DVD Combo, Fresh Water Inlet, 120/240 Volt Inlet, Staircase Handrail, Painted Interior and 150 Year Coating on the Exterior. Walking into the Admiral Series 20×80 bomb shelter you will notice the bullet resistant blast door and staircase that will ensure the safest entrance to your survival shelter. An open living room welcomes you to your new bomb shelter. To the right you will find a very spacious master bedroom that includes its own walk in closet. The closet contains a secret escape hatch with hidden access door. 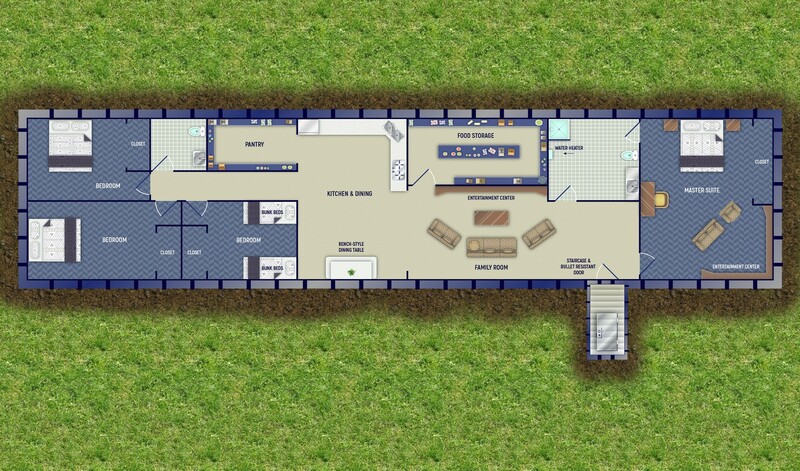 The master bedroom of this bomb shelter includes a large master bathroom. This master bathroom has a shower, composite toilet, sink and tankless water heater. Exiting the master bedroom will lead you back to the open living room. The open living room provides you the liberty of endless furniture arrangements. Continuing down the bomb shelter you will find a giant food storage room. The food storage room of this bomb shelter can be equipped with shelving to optimize your storage needs. This large food storage area can be a huge asset in ensuring your family can survive longer with an abundant food storage capabilities. Continuing through this large Admiral Series bomb shelter will lead you to the kitchen and dining rooms. The kitchen includes large counter top space with a sink, alcohol burning stove. The dining room can include our signature table with bench style seating, or can be open so you have the option of a more traditional table arrangement for your bomb shelter. Right off the kitchen you will find an extremely large pantry area with built in shelving. When you walk down the hallway of the bomb shelter, you will find a bathroom and three additional bedrooms with walk in closets. These bedrooms create private areas for your family to sleep. 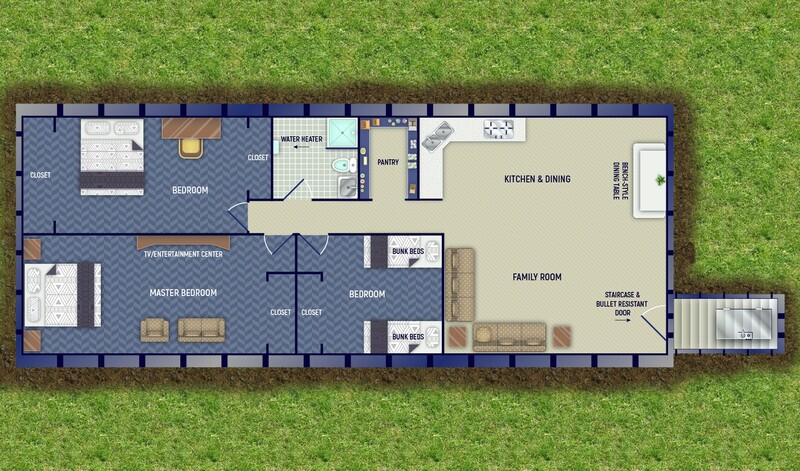 The admiral Series 20×80 bomb shelter is the ultimate underground living solution for your family. Solar Generating Charging System with Battery Supply | 12 Volt LED Lighting | 12 Volt TV/DVD Combo | 120/240 Volt Inlet | Painted Interior and 150 Year Coating on the Exterior | +Much More! Alcohol Burning Stove | Dining Table With Bench | Double Counter | Shelving For Food Storage | Jack Knife Sofa (Doubles as Extra Bed) | +Much More! Water Pressure Pump | Water Heater | Grey-Water Evacuation Tank | Grey-Water Evacuation Pump | Full Kitchen | Alcohol Burning Stove | +Much More!